We offer a wide variety of surgical procedures for dogs, cats and even small mammals. We utilize the safest available anesthetics to provide an extra margin of safety, especially for our older or high-risk patients. All our surgical patients will receive pain medication,pre-surgical blood work, and your pet will also be hooked up to a unit which monitors your pets blood pressure and heart rate throughout the surgery. From the time they are given their first medications until they are alert and recovering from surgery, the doctor or technician will closely be monitoring your pet. Please visit our Surgical page for more information. At Heartland Animal Clinic, we have state of the art surgical equipment to make sure your pet is provided the safest surgical experience possible. We run pre-surgical bloodwork prior to all anesthetic procedures to determine which anesthetics will be safest for your pet. We then administer pain medication prior to the procedure itself. Pre-anesthetic will be given and then the patient will be hooked up to our anesthesia monitoring unit and prepped for surgery. A technician will be standing by throughout the procedure to monitor the patient and to assist the Veternarian. 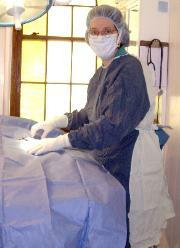 Our surgeries are scheduled Monday thru Friday. Patients coming in for surgery will need to be fasted for 12 hours prior to surgery. Water is okay to give - we don't want your pet to get dehydrated. We ask that our surgical patients be dropped off between 7:30 & 8:30 am. 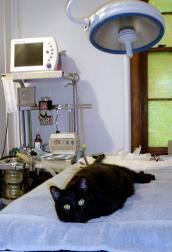 Pets that have been spayed & neuter procedures require a one night of hospitalization. Dental procedures and most tumor removals will be released the same day after 3 pm. For any exoctic pet surgery, they will not need to be fasted, they can eat all the way up until the time of surgery. For any surgery with an exoctic pet, they are sent home the same day after 3 pm. Dr. Sandler does provide the service of neutering your male rabbit, but for our female rabbits we can refer you to a Veterinarian that can provide you the spay service. For surgical procedures on your feline friend, we require that they are update on Feline Distemper vaccine and Rabies. For surgical procedures on your canine friend, we require that your pet is current on Rabies, Distemper, and Bordetella vaccines. For canines we are also requiring that your pet has a current heartworm test, which means that your pet must have been tested for heartworm disease within the past year from the surgery date. The reason why we are now requiring a current heartworm test is because, if your dog is heartworm positive, putting your pet under anesthesia can be risky to your pet's health. If your pet is not current on any of these requirements they will be given upon arrival for your pet's safety. Scratching is a normal behavior of cats: It conditions the claws, serves as a visual and scent territorial marker, allows the cat to defend itself, and provides healthy muscle engagement through stretching. In many cases, a cat can be trained to scratch only appropriate surfaces. However, a cat's excessive or inappropriate scratching behavior can become destructive or cause injury to people in the home. Alternative training and management options: Provide appropriate scratching surfaces, such as dedicated posts and boards that are tall enough to encourage full stretching. What constitutes an attractive surface or lacation varies by cat, so don't be afraid to get creative. Scenting with catnip may help too. Frequent nail trims- every 1-2 weeks, nail caps replaced every 4-6 weeks and positive reinforcement training, beginning with kitten kindergarten are also other alternatives. Pheromone sprays sticky tape and tinfoil can also discourage use of inappropriate surfaces. Punishment is not an effective deterrent. When the alternatives aren't enough: When undesirable scratching is not able to be successfully managed, or a member of the household is immunocompromised with a higher risk of health complications as a result of accidental scratches, declawing may be the only alternative to relinquishment or euthanasia. While not a first choice, nor a minor procedure, if properly performed declawing may allow a pet cat to remain in an otherwise good home. Declawing is a surgical amputation of a cat's claws and the third toe bones to which they are attatched. Most cats will still exhibit scratching behavior after declawing. If performed, this is an elective orthopedic surgery which requires general anesthesia and comprehensive pain management under the care of an experienced veterinarian. Like any major surgical procedure, possible complications include short and long term pain, bleeding, infection and wound reopening. Make a thoughtful choice: Because elective declawing is performed for the benefit of the owner rather than the cat, the procedure remains controversial. The decision to have a cat declawed should be carefully considered in a consultation with your veterinarian. Declawing should only be performed after a reasonable behavior modification attempts and alternatives have been exhausted. Declawed cats should not be allowed outdoors, unless they are under direct supervision.